What I'm Watching: "How High Is Up?" "How High Is Up? ": Larry and Moe use tire irons to pry Curly from his sweater. I have studied and written about film for something like two decades now. I love films of all kinds, from Hollywood rom coms to seven-hour Eastern European art films to spiky avant-garde films that blast the eyeballs and the brain. But when I reflect on the kinds of movies that turned me into a cinephile at a young age, I realize that most of them are decidedly “low-brow.” I grew up watching kaiju movies, martial arts films and, yes, Three Stooges films. Most of the Three Stooges’ films are perfectly free from topicality, and most have narratives that are barely coherent. For those reasons, the films have an almost unfair historical advantage over many other movies: They barely age at all. The Stooges’ brand of slapstick comedy is exactly as funny as it was 50 or even 70 years ago. (These guys made a lot of films, and they made them for a long time.) Many “low-brow” comedies of today — I’m thinking of Scary Movie and its descendants — have already lost whatever meager relevance they had because they are mishmashes of topical jokes with short shelf-lives. The Stooges, though, are eternal. Every now and then, I revisit the Stooges, and I’m pleased to say that I’ve never been disappointed. I recently watched “How High Is Up?”, a Stooges short comedy from 1940, for the first time in at least 15 years. I laughed out loud many times, just as I always do when I watch the Three Stooges. The movie is gloriously preposterous, bordering on the genuinely absurd. Its story (such as it is) is founded on the faintest whiff of logic and causality — and I mean that as praise. “How High Is Up?” does not concern itself with propriety or sensibility, and, frankly, I think we could use more such works of art. That doesn’t mean that “How High Is Up?” is somehow incomprehensible or inaccessible — far from it. It is constructed less from a story than from a series of sight gags, each of them performed and arranged for maximum comprehensibility. Many of the film’s sight gags are, in my opinion, pretty much perfect: inventive, silly and instantly accessible. 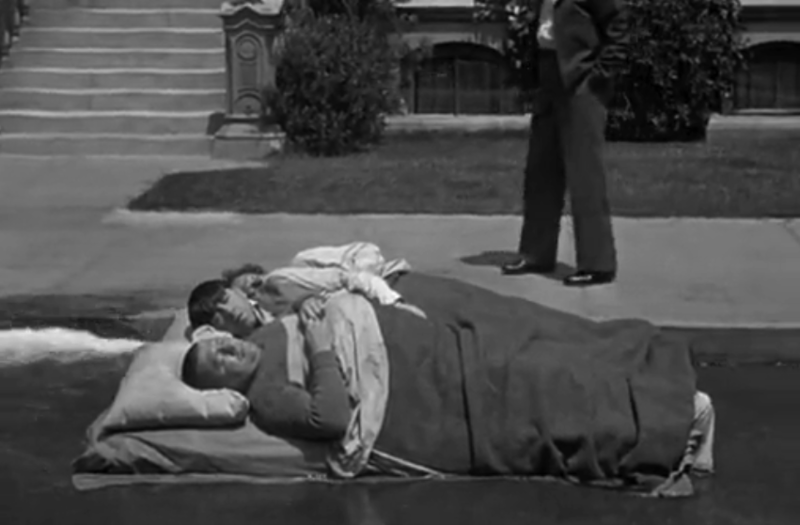 One of my favorites occurs in the film’s first scene, in which Larry, Moe and Curly are all sleeping on a mattress under their jalopy, which is parked on a city street. A guy up the block opens up a hydrant, and the resulting torrent carries the mattress — the Stooges still asleep on it, natch — down the road and into traffic. What makes this a great gag is that it’s clear, novel and preposterous. 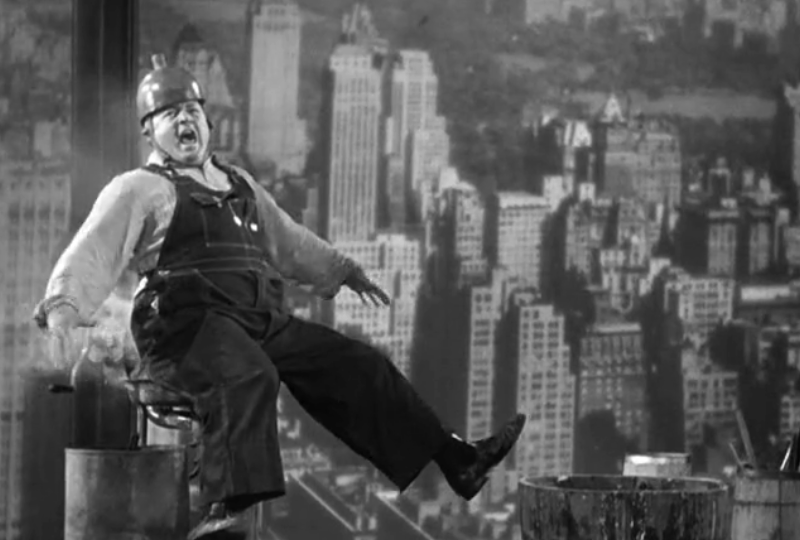 The same may be said of the extended gag, later in the film, that has Curly literally using his head to help Moe drive a rivet into a girder. The films of the Three Stooges are not typically celebrated for their screenwriting, though they ought to be. There’s more to screenwriting than crafting a perfectly cohesive story, and the Stooges’ screenwriters were masters of writing jokes, as a college film professor of mine noted when she singled out a Three Stooges film (I don’t remember which) for its writing achievement. In that film (as she described it), the Stooges are in jail, wondering how they’ll ever get out. “You dummy,” says Moe. “Use the tools!” Tools? What tools? Why, the tools in the bag that Moe pulls out from under one of the bunks in their cell. My professor saw this as a great moment in screenwriting because the film’s writers found a novel, preposterous and fourth-wall-rupturing solution to a vexing narrative problem. It’s the same kind of illogical logic that we find in Looney Tunes cartoons — and that’s high praise indeed. Gutter-sailing in a mattress, Stooge-style. By 1940, the Three Stooges had been performing together for more than a dozen years: since 1928 as a vaudeville troupe, and since 1934 as contract comedians for Columbia Pictures. In the thousands of routines they’d performed during that span, the Stooges used the “tools” gag innumerable times; the “tools” joke in “How High Is Up?” cleverly evokes the group’s comedy history. This is the kind of self-referentiality that I love, and I think it demonstrates fairly conclusively that these films are smarter than their reputation suggests. Indeed, nearly every discussion of the Three Stooges (or of slapstick in general) remarks on the purportedly base nature of this form of comedy. I disagree with this assessment, but do think it’s worth commenting on. Curly cools his heinie in "How High Is Up?" I put quotation marks around the word “low-brow” above because I detest the false distinction between “high” and “low” art. 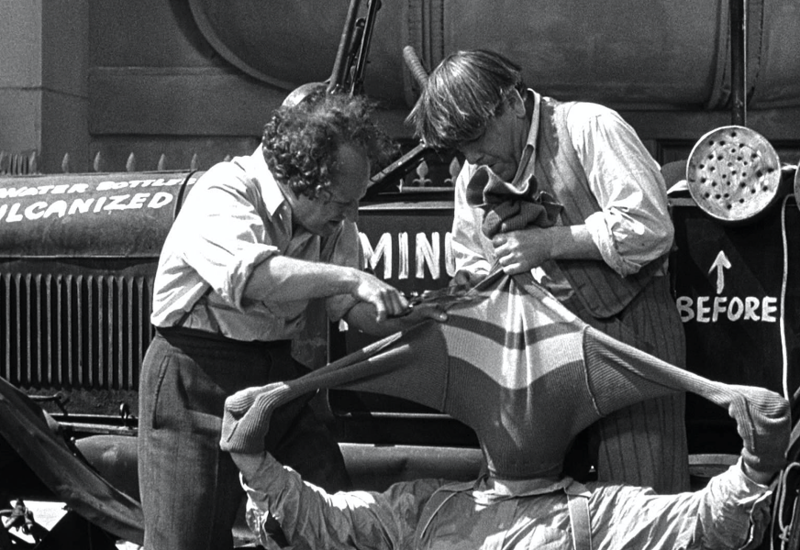 The films of the Three Stooges may have been low-budget, and they may feature a lot of mallets to the head, but that doesn’t mean they are somehow intrinsically inferior to other films. “How High Is Up?” came out in 1940, just one year after Gone With the Wind, which was adapted from a bestselling novel and promoted to the tune of millions of dollars by MGM. In my opinion, Gone with the Wind is a terrible, bloated mess of a film, overlong and melodramatic and far too self-serious to be enjoyable. To me, it is less “honest” than “How High Is Up?” Yet Gone With the Wind is the one with all the awards and the "legendary" status and the commemorative silverware sets. But taste (or the eternal debate between “elephant art” and “termite art,” to use Manny Farber’s famous terminology) isn’t even the issue here. Gone With the Wind and “How High Is Up?” are both examples of mass art, in that large corporations made them for the purpose of selling tickets to as many viewers as possible. They were also both made in essentially the same manner, in that they both rigorously abide by the continuity editing system. They are more alike than different, and any distinctions of “high” and “low” are mostly the result of marketing campaigns and received wisdom. Nor is either of these films “better” or “worse” than, for instance, Carl Theodor Dreyer’s “artsy” 1943 drama Day of Wrath, or than Maya Deren’s pioneering avant-garde film of the same year, “Meshes of the Afternoon.” Such comparisons are inevitably subjective and impossible to prove. I’ve always found that “good of its kind” is a better yardstick of quality: Does a film (or an album or painting or whatever) stand out in quantifiable ways from others of its general type? Start there, and maybe you’ll have a convincing way to defend or attack a given artwork. And you go right ahead and do that, too. I’ll be in the other room, gorging myself on Three Stooges films until I start nyuk-nyuk-nyukking like Curly. My wife and I have a little baby son, not quite eight months old. I’m looking forward to sharing all kinds of valuable life experiences with him, but the one I can barely wait for is sitting on the couch with him to watch Three Stooges movies. Most of them are, like “How High Is Up?”, timelessly hilarious.